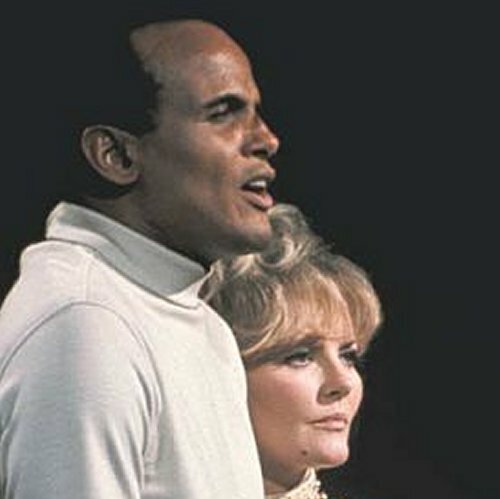 In 1968 Petula Clark generated a storm of controversy when she held the arm of Harry Belafonte while singing an anti-war song on her primetime CBS TV show, as seen in the still above. Petula Clark had become a major international celebrity following the success of the song Downtown which sold more than three million copies in America alone. Among Pet Clark's many fans was Glenn Gould who made a famous 1967 radio documentary titled The Search for Petula Clark. In February I wrote of my attempt to clear royalty hurdles and broadcast/webcast this and other Glenn Gould documentaries, an attempt which failed because copyright holder CBC told me "We could be looking at thousands of dollars" in royalties. UbuWeb is a large web-based educational resource for avant-garde material available on the internet, founded in 1996 by poet Kenneth Goldsmith. It offers visual, concrete and sound poetry, expanding to include film and sound art mp3archives. UbuWeb was founded in response to the marginal distribution of crucial avant-garde material. It remains non-commercial and operates on a gift economy. UbuWeb ensures educational open access to out-of-print works that find a second life through digital art reprint while also representing the work of contemporaries. It addresses problems in the distribution of and access to intellectual materials. UbuWeb does not distribute commercially viable works but rather resurrects avant-garde sound art, video and textual works through their translation into a digital art web environment - re-contextualising them with current academic commentary and contemporary practice. All rights for materials presented on UbuWeb belong to the artists. All materials are for non-commercial and / or educational use only. Confused? So am I. But this post is intended to provide facts rather than judge right or wrong; although I would observe that the problem here is most probably the divergence between legal and ethical right and wrong. For those who side with UbuWeb there are many other riches available, including lots of uptown music; just type Cornelius Cardew, Morton Feldman, John Cage into their search engine or follow those links. My 2007 account of the Petula Clark and Harry Belafonte controversy is here. The video below helps explain Glenn Gould's obsession with Pet Clark. Pliable, I don't think you need to be confused about UbuWeb. The material put online is generally unavailable elsewhere, and includes works out of copyright, works authorized by the copyright holders for use by UbuWeb and orphaned materials, in which no copyright holder can be found. UbuWeb performs due diligence in the case of orphaned materials; should, however, a copyright holder appear and assert their rights to the material, then UbuWeb will remove the material. UbuWeb's record of due diligence and acting in good faith on behalf of any copyright holders is excellent. I believe that your own experience with th Gould/Clark recording is a typical one. The recording is CBC's to control, but until you asked, they probably were basically unaware of it. When you asked, as a state broadcasting company, they were obliged to either seek a significant payment (all major state broadcasters are under huge pressure to make their back catalogs pay) or to reject your request for a non-commercial publication. UbuWeb, upon determining that the material was not currently in print, placed the material online on the reasonably assumption that it had been orphaned. This then put the onus on the CBC to either assert their copyright or to ignore UbuWeb. Daniel, I understand what you are saying. But surely an intellectual property is in copyright or not, and that depends simply on the date of creation and the prevailing legislation? I have not heard of the concept of orphaned materials or the need to assert copyright. My understanding is a work is in copyright irrespective of whether it is commercially available or not. UbuWeb may well act with the best of intentions. But the fact remains they are still offering IP such as the Gould Pet Clark documentary (created 1968) that is in copyright without any compensation to the IP owner. Please understand, I am not saying they are wrong. I am just highlighting what seems to be a very confused state of affairs. I have now asked CBC to comment on this. Pliable, I know you are being playful about "downtown", but it is a tad confusing to the uninitiated to refer to Cage, Feldman, and Cardew as "uptown", since they more properly belong to an experimentalist group of composers better understood as the forefathers of the composers commonly described as writing "downtown" music. But all labels of this kind are of limited utility. The really interesting question is how Ubu Web obtained this material. All this does fall into a really grey area. Certainly, for most of the items on Ubu Web, the audience is extremely small, and the chance of making significant money out of this material even smaller. So they do provide an opportunity to experience this material that is otherwise lost to the general public. On the other hand (and there are seemingly many "other hands" here) it does provide the authors of that material the possibility of proper ownership, however slight the monetary value might be. And back to the real subject of this post. Tris, who has an interesting blog here http://munguinsrepublic.blogspot.com/ and who sung with Petula Clark, posted the following comment to my earlier article on the Harry Belafonte and Petula Clark controversy. It deserves to be repeated here. As Europeans Petula and Claude (Wolff, her husband - Pliable) were at first bemused and then angry and embarrassed by the slight to their guest. The following email has been received. I don't think I need to comment further. Hey there, I've been enjoying your post and can totally sympathize with your predicament. It's for this reason that UbuWeb *doesn't* ask for permission. If we had to ask for permission, we wouldn't exist. So it's a sort of "don't ask, don't tell" situation we find ourselves in. As long as we're not selling anything, most of the time they look the other way. That said, if you haven't already contacted the CBC, I'd appreciate it if you didn't call their attention to it. The Gould stuff has been quietly sitting up there for years without anyone noticing or minding.I'd like to see it remain there. By the way, if anything does come back into print, we immediately remove it. We just did this this morning with a CC Hennix piece that had been long unavailable but now has been reissued. We were asked by the publisher and we gladly agreed. We like to see these works available and circulating.